We’ve been wondering about the fingerprint reader on the Oppo R17 – if it’s not on the back, will it be under the display? That’s exactly what the latest leak claims, showing a telling “fingerprint” graphic on the display. But the credibility of this rumor is under question. Note the dual rear camera – it’s vertical. In the images from TENAA the camera was horizontal. We tend to believe TENAA more than random rumors, though there’s chance there has been a mix-up. 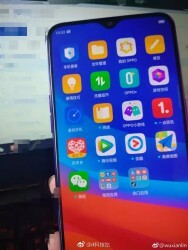 See, the official image of the Oppo F9 Pro shows a horizontal dual camera and a tiny notch. It’s possible the rumors confused the two phones since they look so similar (that notch especially). 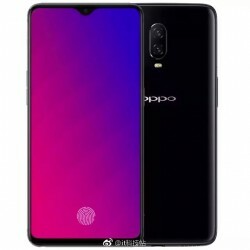 If that’s the case, then the Oppo R17 may indeed have a vertical dual camera, just like the OnePlus 6. 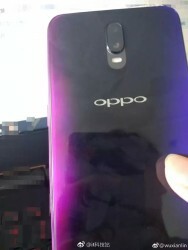 The two companies have been known to share design elements, though the rear camera is the one place where they diverged last time around – the R15 had a horizontal camera, the OnePlus a vertical one. It’s not impossible that Oppo would go for a vertical camera on the R17 (its more premium offering) and stick with the old design on the F9. But as it stands, this rumor gets filed under “maybe”.